Disney has unveiled an official image of Rey's new look in the upcoming film Star Wars: The Last Jedi. 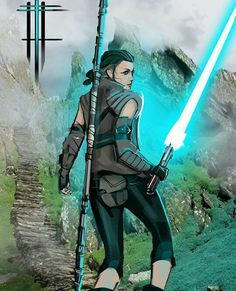 This post will be an analysis of why they changed it and what it means for the future of Rey's journey to be a Jedi. 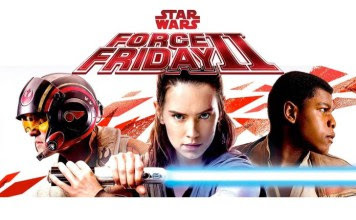 In case you didn't know what Force Friday is, is is a day of the year when Disney and Lucasfilm start selling products for the next installment of Star Wars. It usually happens in December. It starts at midnight and fans flock to their local stores to buy and check out everything from Star Wars action figures, books, clothing, Lego sets, and even cooking utensils and lip stick (saw it in a commercial once). Basically, it is great for any fan of Star Wars or any geeky collector to go crazy because of. 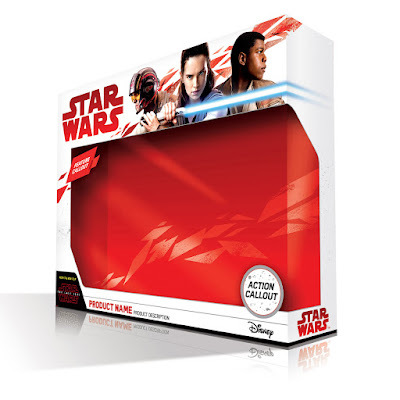 Disney released the above image as an example of what a Force Friday product package may look like. It is basically a fill-in-the-blanks image that they can expand upon later. The most eye-catching part of this is obviously the images of the characters at the top of the box. Poe Dameron and Finn look just about the same as they did in the last movie, but Rey appears too have changed the most. Finn, however, does have a different jacket. The position of Rey is an important thing to notice. She is in the center of the image and is facing directly ahead, while the other characters are at the side and are looking less significant. This means that the new movie may focus a lot more on Rey than anybody else. She has a determined look on her face and is holding the lightsaber in a more experienced way. So she has obviously gone through some training, probably with Luke Skywalker. The image suggests that she also will keep the blue lightsaber instead of getting a new one. Her outfit is more grey-colored, which doesn't really mean anything in particular. Obviously the most interesting change of Rey is her new hairstyle. It is longer then before. 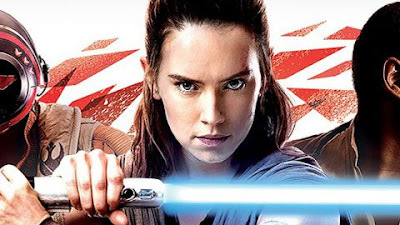 It means that maybe Luke will make Rey change her hairstyle, sort of like how the Old Jedi Order made Padawans-in-training braid their hairs to represent being a student of the Force. Or the hairstyle could mean that since it is longer a amount of time passes after her training and that most of the movie will be after her training. I can only say this assuming that this image is representative of the movie mostly as a whole (sort of like movie posters usually are). I noticed that Rey's hairstyle looks very similar to that of the character Qui-Gon Jinn from the prequel trilogy of movies. They are both very long and in similar shapes. 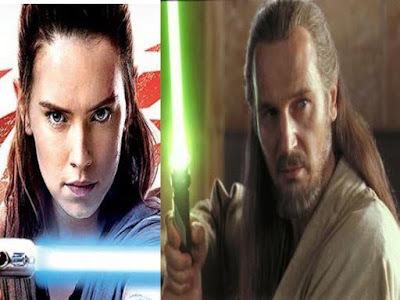 Does this mean that Rey has a connection to Qui-Gon, perhaps? Possibly they are in the same family. Now that I think of it: They have the same nose, both have a British accent, both struggle between the dark and light side of the Force... Hey! This makes a lot of sense! But still, Obi-Wan being her grandfather kinda makes more sense to me. I don't wanna have to explain that theory here. Look it up. The movie is said to have Rey progressing on her journey to become a Jedi. So it all makes sense when you put this into consideration. That is all for this post. Share it with others if you like it. Be sure to view daily and stay tuned for 2-5 posts every week. I have surpassed 30,500 views. Can you guys help me surpass 50,000? When I do, I will make another Blogger Award, except that this time it will be silver. See you next time! BBBYYYYEEEEE!!!!! !